» Daily photo jan 13 2010 "Jeffrey C Wilkins – Wedding Photographer"
For a while now I have been over concerned with creating images that were “un-filtered” and “perfect” but that isn’t who I am all the time. Yes I like “polished” looking images that make you wish that you had taken them but I also like images that are gritty and artistic and don’t necessarily look like they belong in the pages of a glamour magazine. This the way “I see the image” the way I want to show it to you. I want to create the final product not create a canvas for someone else’s “art”. 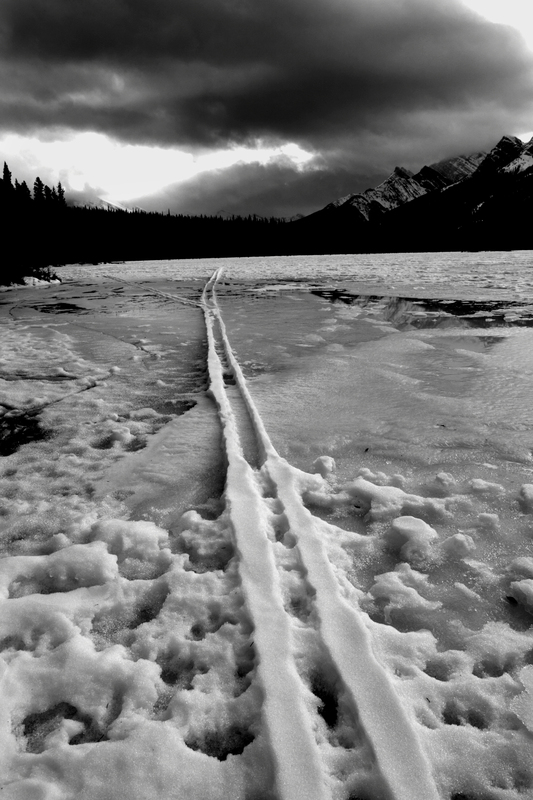 This is the case with this image, a set of cross country ski tracks which stand in defiance as the rest of the snow melts to ice surrounding them, now creating a positive rather than negative trail. The weather and lighting was casting a moody light on the tracks adding to the feeling of isolation and time passed. I pushed the exposure and levels to create a high contrast image to further emphasise the texture on the windswept lake. This is how I saw it, enjoy. This entry was posted on January 13, 2010. It was filed under Uncategorized and was tagged with landscape, mountains, photography, Uncategorized, winter.